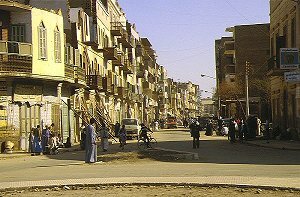 Through the influence of the countless tourists to the relatively small town, Luxor seems open-minded and sometimes even modern in comparison of other Egypt towns. 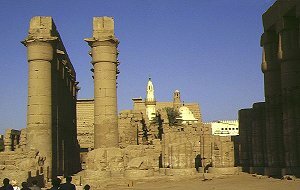 The great Amon-Temple of Karnak is about 3 km outside of Luxor, and apart from the pyramids and Abu Simbel is the most impressive building of Old Egypt. 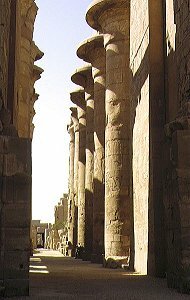 The construction began in the 12th dynasty and many pharoahs continued building the temples. 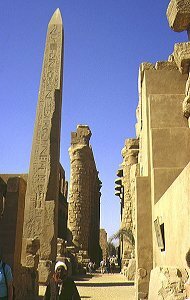 Only some of the original nine pylons remain. 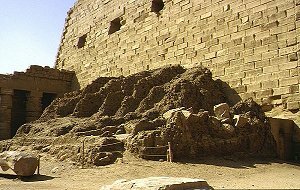 At the wall you can see the remains of a brick ramp which was probably used as a scaffold. 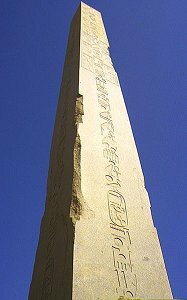 There are many very large obelisks. These are quadrangular pillars made from one rock with a pyramidal top. 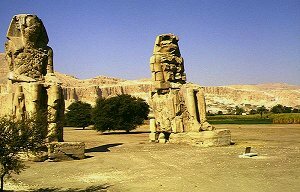 There are small ones in pairs made in the old kingdom and big ones with a height of more than 30 m from the new kingdom. 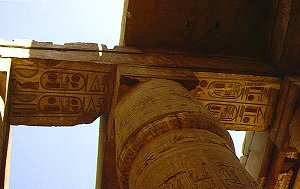 They are usually coated by pictures and inscriptions. They were considered to be a sun-beam, frozen in stone. Fragments remain too, possibly destroyed by enemies or broken during attempts to raise them. 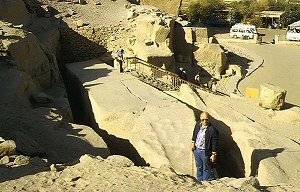 The monolithes were transported to here from far away, most from the quarries of Aswan, where you can see an unfinished obelisk still in the quarry. 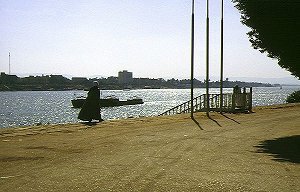 Near the temples there is the "Holy Sea". 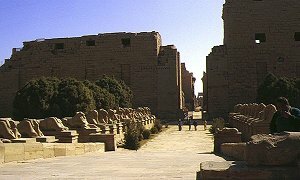 In the past, the Sphinx Avenue connected the temples of Karnak with Luxor and the Nile. 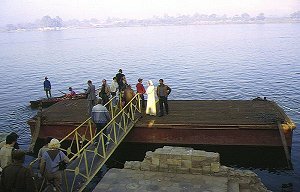 The bark of Amon-Re was pulled on it to the Nile in an procession. The numerous statues are impressive. All buildings are decorated with reliefs, frescos and inscriptions. Because of the lack of rain, the original colours are partialy intact. 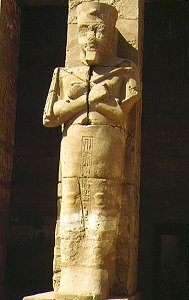 Amenophis IV lived around 1340 B.C. 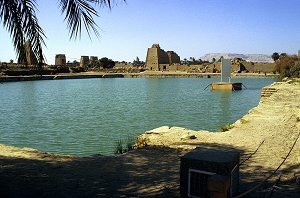 (18th dynasty). 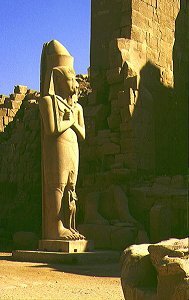 He abolished the old gods, installed a monotheism religion to the sun god Aton and named himself Echnaton. His wife was Nofretete. 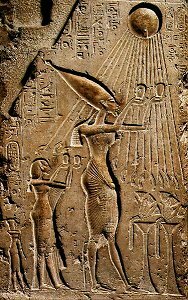 Aton was a new form of the old sun god Ra. 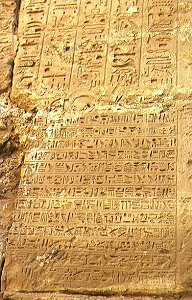 The relief shows Echnaton and Nofretete sacrificing something to Aton. 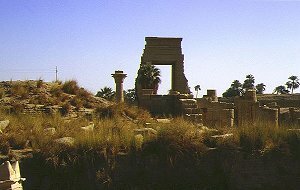 His son-in-law, Tutanchamun, re-inaugurated the old gods and in the period following Echnaton was regarded as a heretic and his name was deleted from the lists of kings. 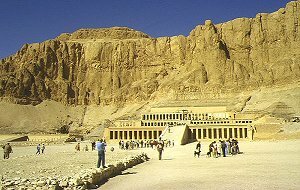 In front of the desert-mountains in which the Valley of the Kings lies, there is the Funeral Temple of the female Pharaoh Hatshepsut. 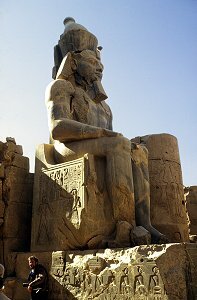 To justify that his daughter became pharaoh, her father Thutmosis I circulated the legend that the God Amon became father of Hatshepsut and therefore she is half a God. 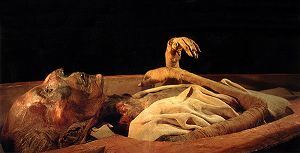 She was married twice unfortunately and her second husband and stepbrother Thutmosis III hated her so much that he had all pictures and inscriptions of her destryed after she died. 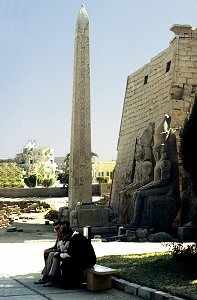 I think she was a very emancipated woman of her era, and brought Egypt peace and prosperity during her reign. 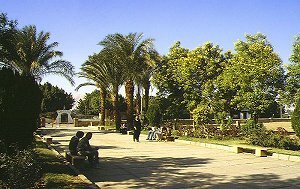 Therefore she is still admired today by young and modern thinking people in Egypt. 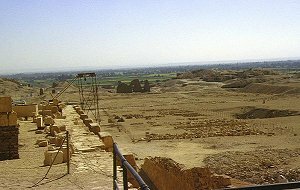 The pictures show the temple during reconstruction in 1984. 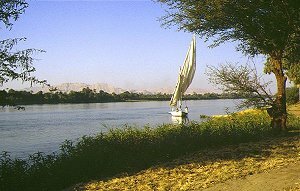 From here one can enjoy a wide view over the Nile Valley. 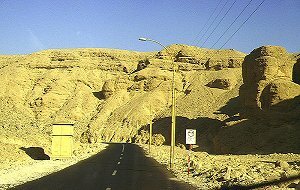 The road leads through dry mountains. 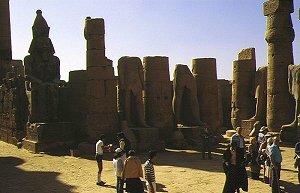 In the newer kingdoms (1539 to 1078 B.C.) 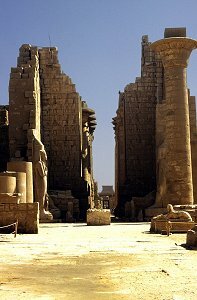 the pharaohs no longer chose the pyramids as their last home but subterraneous chambers. 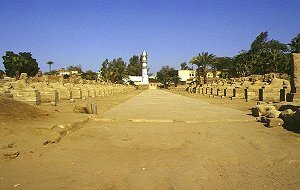 Here nearly 70 tombs were found . Some of them you can visit. 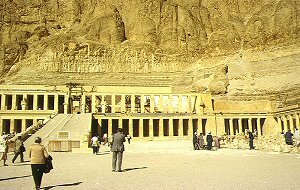 There are no treasures to be found here, they are in the Egyptian museum in Cairo or in other museums all over the world. 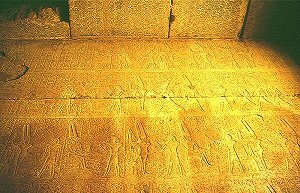 Nevertheless some of the tombs with their mural paintings are very worthwhile seeing. 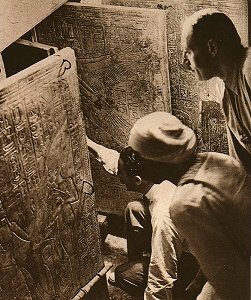 The Englishman Howard Carter found the tomb of Tutankhamun in 1922. 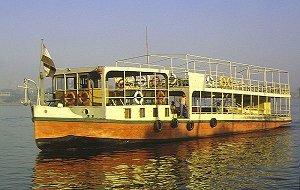 In contrast to others, it had not yet been plundered by grave robbers. 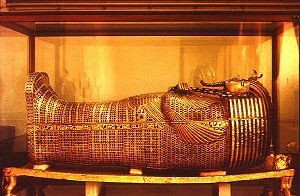 The sarcophagus and the death mask made of gold are probably the most famous objects found. 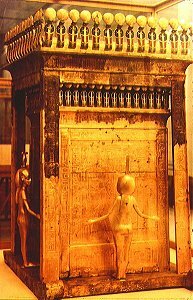 The shrine is made of wood covered in gold and was found in the treasury of the tomb. Grave robbers ran rampant stealing graves in treasured tombs, taking cleaning services to a new level. They would rob anything of value they could find, including the corpses themselves. 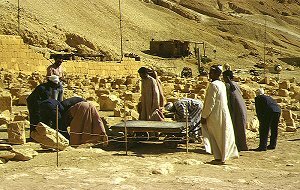 They were hardly your normal cleaning services, as they cleaned out the tombs and sold them illegally for profit. 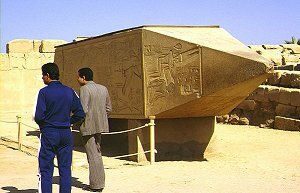 Not only did they rob the actual graves and treasures, they took away the ability for future scientists and archaeologists to find out more historical information about the people and life in those times. 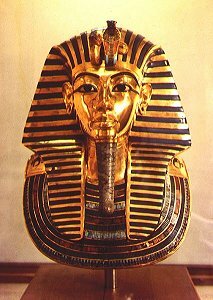 Luckily, Tutankhamun's Tomb was left untouched, which provided a good peak into the life of that time. 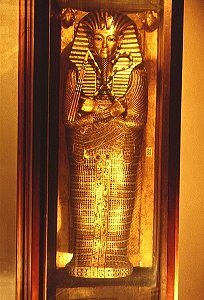 Tombs and other ancient Eqyptian treasures like these displayed in Museums are cleaned with the highest quality cleaning services as not to comprimise the centuries-old pieces.